The entryway of your home provides guests their first glimpse of your home. However, it also has a way of gathering the clutter left by family members as they arrive home from their respective days. In order to make this space welcoming to guests and usable by those living in the home, we have provided these tips and tricks to help with that cluttered front entryway. When your entryway is properly set up and organized, both guests and family will notice the difference. Entryways are a space for the transition from outdoors to indoors and thus receive the greatest challenges for flooring. Rain, snow, mud, and dirt will be tracked into your home at this location, so be prepared to handle these invaders. Neither carpet nor wood is up to the task, so stick with materials such as tile or wood-look porcelain tile. These will withstand the attacks of moisture, salt, and traffic without looking worn or tired. Keep them in great shape with a welcome mat (to trap dirt particles) and sweep and mop as needed. Next, you need to assess the needs of your guests and family. Do you have frequent guests or a large family who all remove their shoes when they enter? Do you like to keep your keys by the door? Do you have a closet for coats? These are all questions that will inform you which tips and tricks work best for your home. If you have a small entryway and not much room for furniture or large items, make use of your walls and front door. Find an organizational wall rack that suits your needs. A rack with pegs can accommodate keys and other items. A small basket can be used for gloves, hats, and scarves. Hang hooks on the back of your front door to hold coats. Utilize vertical space as often as possible in small spaces. In larger spaces, a small chair helps with removing shoes and provides a great location for lacing up those sneakers before a run. A table with small baskets gives a home for keys or change, and perhaps the daily mail. A tall vase can be used to corral umbrellas nearby. Finally, create a system with a place for each item and make it easy to use. If everything always goes in its place, then the area is less likely to become cluttered. For those times when life gets in the way, the final step to keeping your entryway clutter-free is to go over it once a week and pick up anything that is out of place. 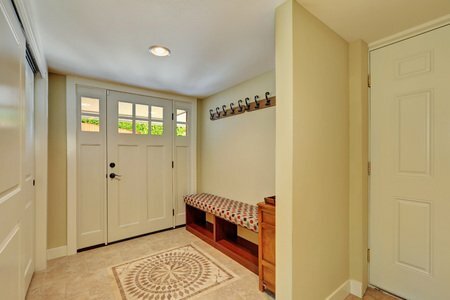 Following these simple steps will help you to keep your entryway clear.